08h15: Departure from Hammamet or Sousse or Port El Kantaoui. 12h30: Arrival at the first hotel. 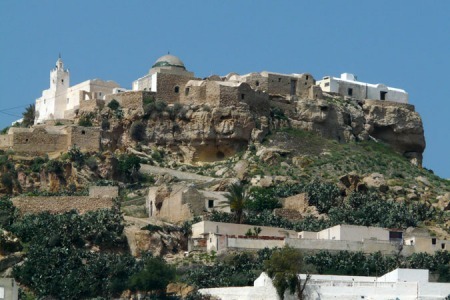 Takrouna: Takrouna overlooks the Gulf of Hammamet, Hergla, Sousse, jbel Zaghouan and Kairouan. This strategic location made it the field of several battles during the Second World War. Zeriba: The old village, Zriba Alia (Zriba high), of Berber origin, is located about three kilometres south of Hammam Zriba. Built between two rocky peaks, the town now in ruins overlooks Jebel Zaghouan, the second highest peak in Tunisia after the Djebel Chambi. In the middle of the old town is a dedicated Zawiya Sidi Abdel Kader Jilani, founder of the Qadiriyya buried in Baghdad. This Zawiya, built in the seventeenth century, has been a very thorough restoration; it features antique architectural elements and played the role of Koranic school (maktab) for young children. Zriba was deserted by its inhabitants in the 1960s, after the development of the new city in the plains.